In 1978, Stephen King was invited to be writer in residence at the English department of his alma mater, the University of Maine at Orono. He moved his family into a rented house on a major highway in Orrington. The heavy traffic included transports heading to and from a nearby chemical plant. A new neighbor warned the Kings to keep their pets and children away from this road, which had “used up a lot of animals.” In support of this claim, the Kings discovered a burial ground not far from the house, with “Pets Sematary” written on a sign in a childish hand. Among its residents: dogs, cats, birds, and a goat. Shortly after they moved in, daughter Naomi’s cat, Smucky, was found dead on the side of the road when they returned from a trip to town. King’s first impulse was to tell her that the cat had wandered away. Tabitha, however, believed this was an opportunity to teach a life lesson. They broke the news to their daughter and conducted a feline funeral, committing Smucky’s mortal remains to the pet cemetery. A few nights later, King discovered Naomi in the garage, jumping up and down on sheets of bubble wrap, indignant over the loss of her pet. “Let God have His own cat. I want my cat. I want my cat,” she was repeating. The road almost “used up” the Kings’ youngest son, too. Owen was about eighteen months old when he wandered dangerously close to the highway. To this day, King isn’t sure whether he knocked Owen down before he reached the highway as a tanker approached or if the boy tripped over his own feet. Owen had been born with an unusually large head, and the Kings had already agonized over the possibility of losing him to hydrocephalus. This near miss was an unwelcome reminder of the fragility of their children. Working in a room in the store across the street from their house, King decided to explore the alternate scenarios these incidents provided. He incorporated a dream he had shortly after the roadside incident, about a reanimated corpse walking up and down the road outside the house. Among the books influences are cautionary tales such as “The Monkey’s Paw” by W. W. Jacobs story and Frankenstein (Louis calls Church “Frankencat” at one point). He also makes use of the native tradition of the Wendigo, making use of legends from the book Where the Chill Came From: Cree Windigo Tales and Journeys, compiled by Howard Norman. He finished the first draft of Pet Sematary and put it in a drawer. When he reread it six weeks later, he deemed it too gruesome and disturbing to be published. His wife found the scene where Gage Creed dies hard to deal with. Taking her advice, and that of Peter Straub, he put the manuscript back in a drawer, where he intended it to stay forever, and moved on to The Dead Zone. He told Doug Winter, “The book started off as a lark, but it didn’t finish up that way. It stopped being a lark when I realized that the kid would have to die—and that I had never had to deal with the consequences of death on a rational level.” The death of Tad Trenton in Cujo had been bad enough, but there he had been able to avoid the aftermath. King mentioned the book in passing during an interview on Good Morning America in response to a question about whether he had ever written anything so frightening that he’d never publish it. A mythos arose around the novel. Pet Sematary would have remained unpublished, though, if not for an ongoing struggle with Doubleday. The original contract he had signed with them allowed them to mete out his accrued royalties at a rate of only $50,000 per year, while investing the rest, a practice that allowed authors to defer taxes on the money. By the early 1980s, Doubleday had millions of dollars in reserve, and it would have taken the rest of his life to dole it out at the specified rate. Despite the fact that the book came out the same year as Christine and without any promotion from King, it sold well over 600,000 copies in hardcover, which represented a huge jump for him. He had thought no one would want to read it, but they did. “It just goes to show: you should never underestimate the taste of the reading public,” King told author John Connolly. Introduction, Pet Sematary (Pocket Books, 2001), ix-xiii. Interview with Douglas E. Winter, The Art of Darkness, 1984. “The Return of Timmy Baterman,” an excerpt from Pet Sematary, was published in the Satyricon II program book. “Topic, Horror!” by Craig Madderno. USA Today, May 10. 1985. Interview with Mike Farren, Interview XVI, no. 2 (1986), 68-70. “King of the Road” by Darrell Ewing and Dennis Myers. American Film. June 1986. Wonderful article, Bev. My reread of this novel was excruciating. I felt like I was spiraling into madness with Louis. And while I’ll (probably) never read it again, Im so happy it was published. This is what HORROR is all about. Thank God Owen was fine! Great post, Bev. Also a great book, the first of King’s that I read way back in my youth. I’m glad Tabitha didn’t object and that it was published. I have read most of Stephen Kings books (or am about to, not enough time for my 500 other books to also read!). He always has a theme, subtly written in each book or short story. His stories usually end sadly, for the main character (and the reader!). But even though there is sadness in so many of his books, sometimes the struggle ends up to be uplifting, and almost (and I say almost), happy. For Mr. King to go through the scenario of Pet Cemetery in real life and come out ahead, unlike his hapless characters, well, he must look back ever so often and shudder. “I dodged a bullet and my kids are alive”. 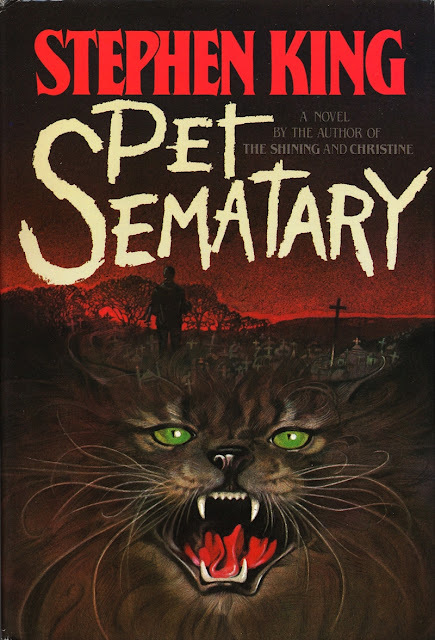 I can’t say I “enjoyed” Pet Cemetery in the usual sense of reading his books, but the story was there and, hopefully, he has excised (is that the right word?) his demons. I thank him every day for his stories and hope he writes many, many more. He writes, I buy. And I thank him for creeping out my two daughters for life with Pennywise. They absolutely HATE clowns. And I, as a good mother, go out of my way to send them the weirdest and creepiest pictures or clown items that I can find. Great piece on a great book by Stephen King (and subsequently, one of the better filmed adaptations of his work). Pet Sematary is certainly one of King’s darkest novels, so it’s interesting to see he felt it was also, to the point of not wanting to even publish it. I’m glad it was, as it ended up making for a very creepy movie. And there’s nothing wrong with horror going to it’s darkest extremes every so often. It’s too bad that King has mixed feelings (at best) about Pet Sematary. It’s one of the best things he’s ever written, and truly one of the great horror novels of the twentieth century. Beautiful, terrible, sad, and flat-out horrifying. I think this is probably my favourite King book that I have read to date. I finally got around to it last year (I know! ), having seen the movie countless times. It is basically pure dread and sorrow, with sprinkles of hope and determination too. Very happy that it found it’s way out of the drawer – maybe that drawer could have been called “Book Cemetery”. King’s best novel, my favorite novel of all time, and a towering achievement in gothic horror that ranks alongside Dracula and Frankenstein. Fans should also seek out T.E.D. Klein’s The Events at Poroth Farm written in 1972 which was undoubtedly an influence on Pet Sematary. A very moving essay Bev. I have never read Pet Sematary, but I watched the movie. Maybe that could be the reason I have never read it yet. The main thing that bothered me about that movie was when the little boy died. That saddened me so much. Then when he was brought back just to die again, that bothered me even more. It broke my heart. It was so believable I actually cried. That part alone was enough to cause nightmares for a month. That was a very scary movie indeed. I think I can understand why King maybe didn’t like that book. In my opinion there was too much darkness involved. But that is just my opinion. That book is the only one I’m not sure about. Maybe if I read it I might understand it a little more. Don’t get me wrong, Stephen King is at the top of my list of authors. There’s no other author like him. He knows what it takes to get inside a reader’s head, and you never forget it. I’m just debating on whether to read that book or not. Maybe if I had read the book first and then watched the movie, I might see things a little different, I don’t know. Again, a great essay. All of you do such wonderful work on these essays. I like getting involved. Read the book, its creepier and much more in depth than the movie. I was actually let down by the movie because the abilities to reproduce some of the scariest parts of the book could not be done with the technology available at the time. When I read the book it was always before going to sleep, I found myself skrunching up under the covers totally creeped out by what I was reading, talk about invoking a response. Keep an open mind when you read it because it is so much better than the movie. I agree. Though that movie isn’t terrible, I don’t feel that it nearly comes close to doing justice to the book. But I don’t feel that most of the SK adaptations are that great, with some exceptions that are truly exceptional. I think that in the right hands (possibly Darabont) a Pet Sematary remake could be exceptional. Interesting. How, then, does he explain Revival? That novel is the bleakest thing I have ever read; in fact, it’s so dark that it makes Pet Sematary seem like it’s part of the DiscWorld series. Wow, I hadn’t really thought about that. You’re right — Revival is bleak as hell. I think King was more perturbed about Pet Sematary because it struck at the heart of the thing King holds dearest – family. Revival is very clearly about good versus evil while there are many shades of grey in Pet Sematary. Louis Creed has conflicting feelings about his family and is driven by guilt and shame. Was Louis punished because of his ambiguous feelings towards his family? Many times he fantasizes about running away with Gage because he resents his wife and daughter and believes they are disruptive to the ‘male order’. Revival is about an outside enemy. Pet Sematary is about the enemy within the stony heart of man. Louis pays the ultimate price for his confliction – he loses everything. It wouldn’t be a stretch to say that King is more disturbed by the destruction of family order than the destruction of mankind. One could say that the wendigo perpetuated all the sequence of events including the temptations in Louis’ heart. Thereby making it an outside evil similar to Mother in Revival. I think the main difference is with the finesse in which it was delivered. Pet Semetary, we danced with the wendigo the entire gloomy story. In Revival, Mother came and smacked us in the face. Good point, although the extent of the Wendigo’s influence is also debatable. Does the Wendigo make man do bad things, or just bring the bad things to the surface? We never know if the Wendigo is lying when it says those awful things about Norma Crandall. We are never fully told whether the Wendigo used Jud as an instrument to get Louis to the Pet Sematary, or whether Jud already harbored dark thoughts. This is what makes the work so compelling. Thanks for writing (and posting) this. PET SEMATARY has been problematic for me from its publication, but as I get older I find myself admiring King’s basic honesty more and more. It was obviously a hard book to write, and for the thoughtful it is a hard book to read, but it is also a very important book both in King’s corpus (so to speak) of work and in fiction–not just horror fiction–in general. For me this is King’s darkest book. There is a sense of dread that starts on page 1 and never lets up! That scene when Louis pulls the cotton from Gage’s corpse!! Man it still gives me the willies. Knew the backstory on this one already but you deftly tie it all together in this article. The thing I remember most from Pet Sematary (the book) is when the next chapter jumps right to Gage’s funeral! I felt like I just got punched in the stomach,I had to stop reading for a minute to let it sink in. I lost a child recently and will never be able to read the book or see the movie again,it really hits close to home. I was SOOOO looking forward to my re-read of this book. I read it as an impressionable early teen in the mid 80’s and thought it was incredible. I haven’t read it in over 30 years. Unfortunately, now when I compare it to the Stand, the Dark Tower novels, even later stuff such as Under the Dome, I’m afraid it pales in comparison. Still a good book, but now I realize it’s just that…. a good book and not the life changer I thought it was. Thanks for the GREAT essays! I love this project and can never get enough SK. Bev, I think it’s time for King’s biography to be written. I’m thinking around 700 pages to do the job correctly, and you’re just the person to write it. That would definitely be a book to read! “Pet Sematary” is King’s all-time creepiest book. I cared for all the characters so their decent in madness and violence was that much more upsetting. Great article, thank you. Pet Sematary is probably the only Kind novel that scares me psychologically because it actually puts the reader in the awful position of Louis and asks us whether we would do the same thing if in his situation. It’s an horrific choice- do we let our child go or try and bring them back knowing there will be terrible consequences? I dig all the behind-the-scenes publishing info! I knew King wasn’t crazy about publishing PS but I didn’t know the actual $ deal. The novel’s always been one of my faves due to that very darkness (and palpable grief) that gave King pause. Thanks for the post! Wasn’t sure where to ask this but listening to 11/22/63 again and came across the phrase Full Dark. Thinking back now that I have either read or listened to the unabridged audiobook or both of everything he’s written. I’m wondering does he use that phrase in every book? Ever since Full Dark , No Stars came out I notice it, without thinking to keep track, but it is in a lot if not all. but wondering does anyone know or can Richard keep track as he moves forward? Rob, you aren’t alone! I’ve also noticed it a lot when I’ve been re-reading both older and newer King books. The phrase never stood out before, of course, but now I notice it every time. He has used it a lot before that particular book title, that’s for sure. I like “full dark” as a description. I really like the phrase as well. I don’t suppose it did but does anyone know if it originated with King? GOOD question, I’m not sure the history of it! It appears to be something he’s fond of. It appears as far back as The Shining, The Stand and Night Shift. Earlier, if you consider when The Running Man and The Long Walk were written. I do find it interesting that when you Google the exact phrase, there are pages and pages of hits corresponding to the novella collection before you get to anything not pertaining to that book!